Whilst cleaning out my freezer to make room for the many containers of winter soups I am planning, I discovered half a loaf of sliced organic honey whole wheat bread. It was that nice firm, dense sort of bread, although I expect any whole wheat or multi grain bread would work for this recipe. This bread had 0 fat grams/slice, but if your bread has 1 gram of fat/slice, it would only increase the overall number of fat grams/serving slightly. Since I didn’t wan to try to use all of it for morning toast, but I did want to get it out of the freezer where it was taking up precious space, I decided to make bread pudding. Now I am a great fan of bread pudding of the cinnamon-sweet kind, with raisins and perhaps bourbon, but this bread seemed to suggest a more savory treatment that could be used as a side dish (or even a main dish with a nice salad on the side) and taken for lunch. The original recipe came from Cooking Light, but I changed it quite a bit, because I wanted more cheese and I didn’t want ham in it. I also wanted to cook it in a single pan, instead of in individual ramekins. Preheat oven to 375. Cut the bread into ¾ inch cubes. 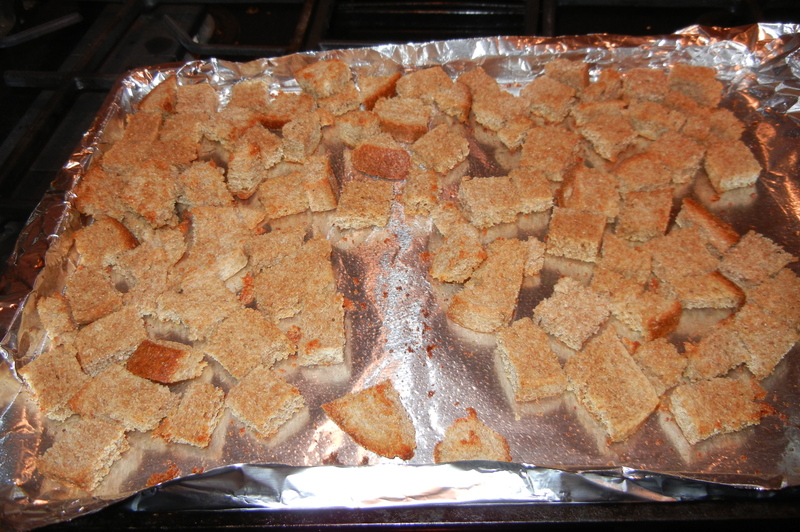 Place bread cubes on a cookie sheet; coat with cooking spray. Bake for 10 minutes or until lightly toasted, turning once. Remove from oven and let cool. Combine bread, 3 ounces of the cheese, 3 tablespoons of the onions, milk, chicken broth, pepper and egg substitute. Spoon mixture into an 8 inch square pan coated with cooking spray. Sprinkle the remaining cheddar cheese and onions evenly over the mixture. Bake at 375 for 30-40 minutes or until lightly browned and firm. Makes 4 servings at 4 grams of fat/serving. Someone gave me an immense yellow zucchini. Now I love yellow squash, and I have been eating them from the garden sautéed, in soup, and in stews. But this squash had gone way beyond the delicate structure of spring and summer zucchini. It had grown fat and swollen – well beyond delicate. I knew it would be too pulpy to eat plain. So I grated it coarsely and searched for recipes. Besides, it’s baking weather, so that the oven can keep my kitchen and little family room warm. This moist and very chocolate-y zucchini bread is a combination of many recipes, converted to low fat. Usually, I prefer muffins, but since I wasn’t sure how this would work out, I decided a loaf would be safer for the experiment. Now that I’ve tried it, I think it would also make great muffins. I sliced it and froze about half the slices to put in my lunch. It freezes beautifully. Preheat oven to 350 degrees. Spray a 9 x 5 inch loaf pan with cooking spray. In a large bowl, cream butter and sugar together. Beat in applesauce and eggs. Add water, and vanilla and stir. Beat in flour, baking soda, salt, baking powder, cocoa powder and pumpkin pie spice. Fold in grated zucchini and chocolate chips. Pour batter into prepared loaf pan. Bake until wooden pick inserted into center comes out clean, about 1 hour. Cool 10 minutes, and remove from pan. Makes 12 servings at about 4 grams of fat/serving. Here is something that will look and taste great at your Easter brunch or some other special occasion, and have significant Wow factor if you bring it to someone’s potluck. I made these to take to a potluck. Since people don’t often make homemade rolls to bring, they were a big hit. I associate brioche with eggs and butter and other rich things. So I searched all over for a low fat recipe. To my astonishment, the low fat recipe was exactly the same as the ones in all my regular cookbooks. Who would have thought it! The original recipe is from Cooking Light, but it really is the same as the one in my food processor bread cookbook. It is also made from everyday ingredients you might have in the house, so you don’t need to make a dash to the grocery store to prepare it. Dissolve yeast and sugar in warm water in a large bowl, and let stand for 5 minutes. Stir in milk and eggs. Lightly spoon the flour into dry measuring cups, and level with a knife. Add 3 cups flour, butter, and salt to yeast mixture, and stir until blended. Turn the dough out onto a lightly floured surface (or into your food processor with a dough hook). Knead until smooth and elastic (about 10 minutes); add enough of remaining flour, 1 tablespoon at a time, to prevent dough from sticking to hands or dough hook. Place dough in a large bowl coated with cooking spray, turning to coat top. Cover dough, and let rise in a warm place (85°), free from drafts, 1 hour or until doubled in bulk. Punch the dough down; cover and let rest for 5 minutes. Preheat oven to 375°. Coat a 12 cup muffin pan with cooking oil. Divide dough into 12 equal portions. Working with 1 portion of dough at a time (cover remaining dough to keep from drying), remove 1 rounded teaspoon of dough from each portion, and set aside. Place the larger portions of dough in muffin cups coated with cooking spray. Make a deep indentation in the center of each portion using a floured finger. Shape the reserved pieces of dough into balls. Press one dough ball into each indentation. Cover and let rise 30 minutes in a warm place (or until doubled in bulk). Uncover dough. Combine 1 tablespoon water and egg white; brush over dough. Bake at 375° for 25 minutes or until golden brown. Serve warm. This makes 12 buttery and impressive brioche at 6 grams of fat/roll. Variation: You can also make a regular brioche, which is a fancy bread that can be sliced. Instead of separating the dough into 12 pieces, leave it whole and remove ¼ cup of the dough to set aside. 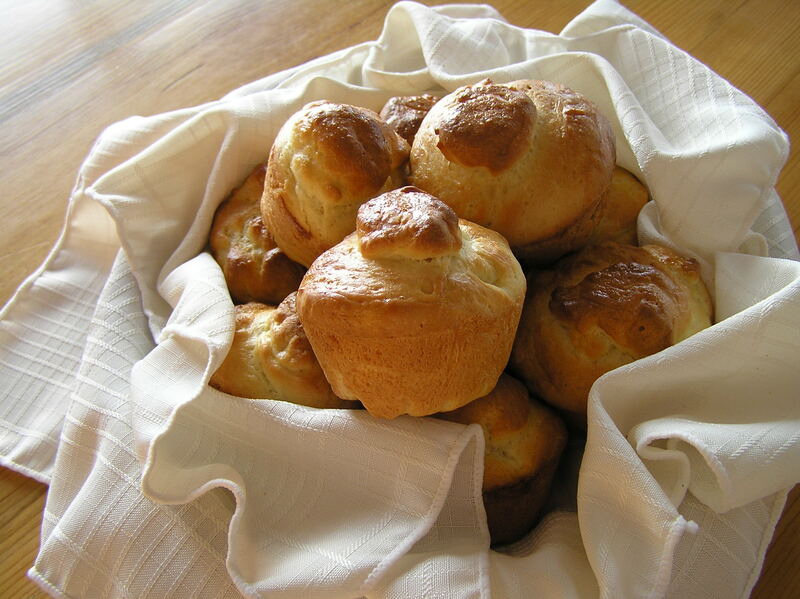 Place the dough in a brioche pan (a special fluted pan that makes the bread look pretty). Shape the reserved dough into a ball. Make an indentation in the large piece of dough, and place the reserved dough into it. Cover and let rise 30 minutes in a warm place. Uncover dough. Combine 1 tablespoon water and egg white; brush over dough. Bake at 375° for about 35-40 minutes or until golden brown. Makes 12 slices at 6 grams of fat/each. 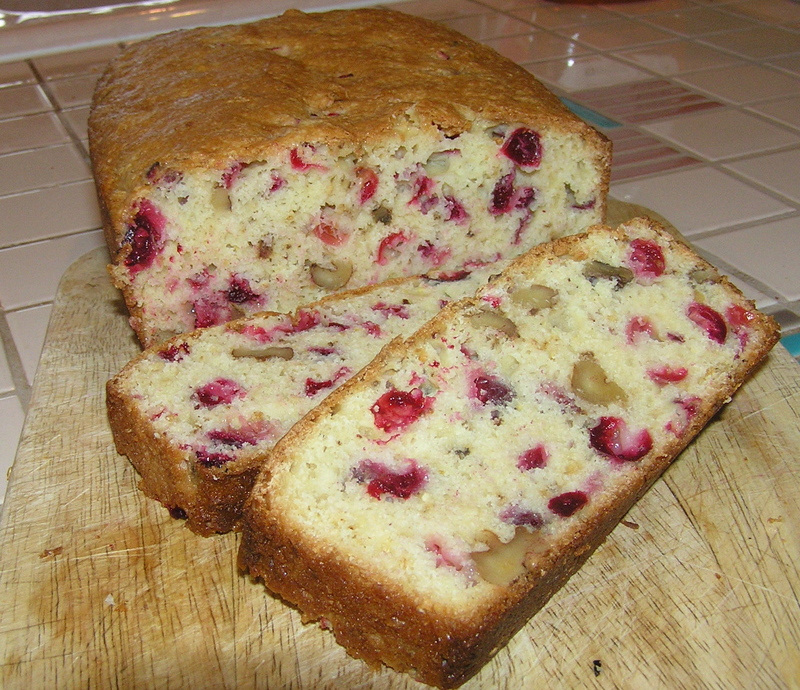 Just in time for Thanksgiving – Cranberry Bread. This isn’t fancy cranberry bread. It’s the recipe on the back of the bag of fresh cranberries, lightened up a bit. It is one of my favorite recipes when fresh cranberries are in season. It is delightful with your morning coffee or with an afternoon cup of tea. It’s delicious with a bit of low-fat cream cheese, although that makes it somewhat of an indulgence. The recipe doubles easily so you can make a loaf to take to a friend’s house. I left the nuts in, even though they add a bit to the fat content. It is the contrast of the tart cranberries and the crunchy nuts that I really like. And it looks so pretty when it’s sliced. Preheat oven to 350. Spray a 9×5 inch loaf pan with cooking spray. In a large bowl, whisk together flour, sugar, baking powder, salt, and baking soda. Stir in the orange juice, oil, applesauce, orange peel and egg substitute until well blended. Do not over beat. Stir in cranberries and walnuts. Spread evenly in loaf pan. Bake for 35 minutes or until a toothpick inserted in the center comes out clean. Remove from oven and cool on a rack for 15 minutes. Remove from pan and cool completely. Makes 12 nice sized slices at about 5.5 grams of fat/serving. Still cold. Makes me feel like baking. Turn on the oven and the kitchen becomes warm and cozy. Since my family room is part of the kitchen, I have a toasty place to read and catch up on household tasks at the kitchen table. I’ve already baked 2 loaves of my regular no fat banana bread, one of which is sliced and in the freezer to take for lunches. I still had bananas, so I decided to make a banana bread that I made quite a few years ago. Back then, the non-profit organization that I manage was just starting out, and we wanted to have a press conference to announce some accomplishment – I don’t remember the details. Knowing that mostly junior reporters get sent out to cover low-level community events, we decided to lure the press with home made baked goods. We were then small and new, and we invited everyone we knew for goodies so the press would see a little crowd. We did get some television coverage, which thrilled us. This was one of the home baked goodies I made. The original recipe came from Cooking Light. It is not as dense and moist as my regular banana bread, and it seems much sweeter to me, almost like cake. Preheat oven to 350°. Spray an 8 1/2 x 4 1/2-inch loaf pan (see note) with cooking spray. Lightly spoon flour into dry measuring cups, and level. Combine the flour, baking soda, and salt, stirring with a whisk. Place sugar and butter in a large bowl; beat with a mixer at medium speed until well blended (about 1 minute). Add banana, egg substitute, applesauce and yogurt. Beat until blended. Add flour mixture; beat at low speed just until moist. Place chocolate chips in a medium microwave-safe bowl, and microwave at HIGH 1 minute or until almost melted, stirring until smooth. Cool slightly. Add 1 cup of the batter to chocolate, stirring until well combined. Spoon chocolate batter alternately with plain batter into prepared pan. (I did 3 layers of plain batter and 2 of chocolate.) Swirl batters together using a knife. Bake at 350° for 1 hour and 15 minutes or until a wooden pick inserted into the center comes out clean. Cool 10 minutes in pan on a wire rack; remove from pan. Cool completely on wire rack. This makes 12 servings at about 4 grams of fat/serving. NOTE: This recipe called for an 8 1/2 x 4 1/2-inch loaf pan, which I used. 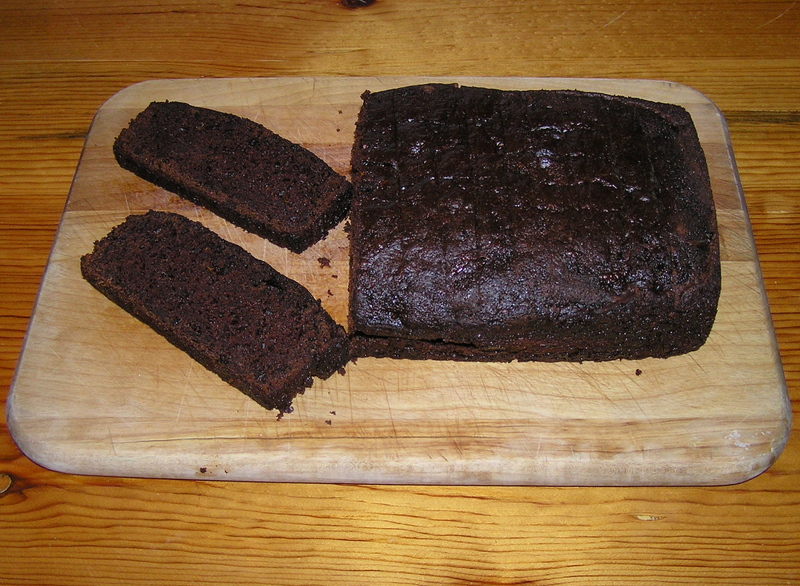 I wasn’t totally satisfied with the way it baked – a little too dark around the edges. I think the last time I made it I used a regular 9 inch loaf pan, and it might work better in that pan. Also, the original recipe said 16 slices, which in the smaller loaf pan was really not realistic. A slice would be only /2 inch thick. HINT: Many recipes call for softened butter. I don’t use much butter, so I keep my butter in the freezer. When I need softened butter, I really do not want to defrost an entire stick to cut off a piece and and then refreeze it. But trying to hack off two tablespoons from a hard frozen stick of butter really isn’t feasible. So I cut thin slices off the stick of butter until I have the proper amount. The thin pieces soften quicker than a whole chunk, too. Now this hasn’t been so bad in the fat gram department: the ice cream is reduced fat, the chips and crackers are low fat, the corn was basted with light butter. I really don’t keep anything in the house that will derail the fat grams completely. But nutritionally, I can’t say that I’ve been great – OK, the fruit is good nutrition. I finally microwaved a haunch of buffalo so I had some real protein. The abysmally hot weather has finally broken (Oh please don’t fix it. I need the respite.) I decided it was safe to turn on the oven. When I was cleaning the freezer, I noticed that I had accumulated a great deal of leftover French bread – the remains of the bread I used for the various stuffed French toast experiments I posted earlier. I didn’t want to throw the bread out, but leftover French bread is bulky and takes up a lot of valuable freezer real estate. 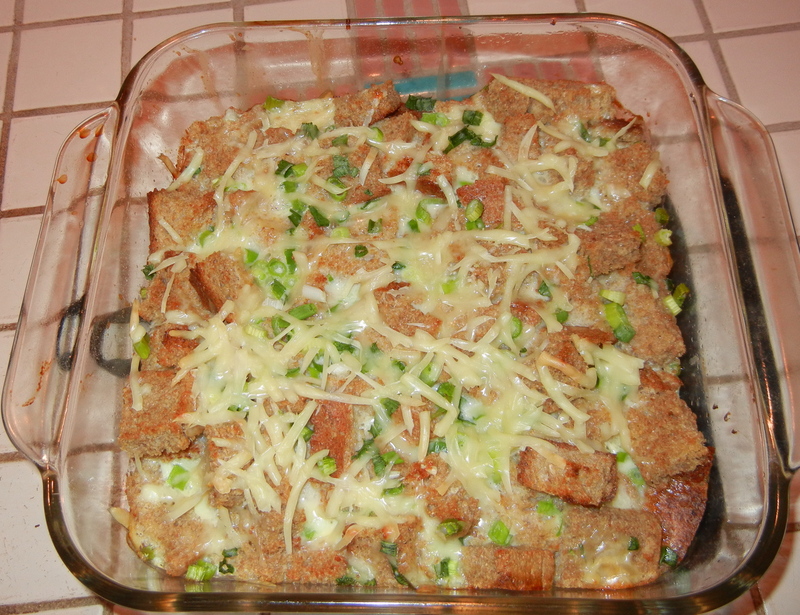 Bread pudding came to mind; it’s a great way to use up leftover bread in general. But this bread pudding is different than most. It’s not a dessert; it’s either a side dish, or even a main dish, which would work well with a nice salad. I ate it as a main dish a couple of times, and then took it for lunch where it reheated nicely (I will shamelessly say I even scarfed it down cold one day.) Made with vegetable broth, this makes a vegetarian meal. Heat oil in a large nonstick skillet over medium heat. Add chopped fennel, onion, and garlic cloves; cook until golden brown (about 20 minutes), stirring frequently. Add 1/4 cup broth; cook until liquid evaporates, scraping pan to loosen browned bits. Stir in 1/4 teaspoon pepper. Add remaining broth; bring to a boil. Remove from heat. Combine bread and fennel mixture. Stir in cheese. Spoon mixture into the prepared baking dish. Bake 1 hour and 10 minutes or until golden brown. Makes 8 servings at 3 grams of fat/serving.